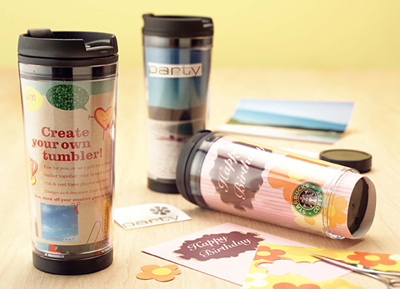 Purchase a Starbucks “Create Your Own Tumbler” at starbucks.com, or on ebay. newer 16 oz (psd format only) COMING SOON! Open the template in Photoshop, or Photoshop Elements, or your preferred graphics program. Copy the graphic you want to place in the template to your clipboard. I advise that the graphic to be pasted into the template be at least 1650×1275 in size, unless you plan on using a smaller graphic on a colored background. Then, you need to select all of the white part of the template using the magic wand tool, and then do a "paste into" (found in the edit menu) to insert the picture you want to put on the template. After you do this you can tweak the postion of the graphic, and change the size if it’s needed. After you’re happy with everything, save the template as a jpg. Make sure you do not overwrite the original template file, so you can use it again. If you accidentally do you can always just download a fresh copy here. Next, print out your insert using a color printer with high quality, letter sized (8.5 x 11″) photo paper for the best results. Carefully cut the insert from the page… Be sure to cut exactly on the boarder of the picture, and the white background. Do not leave any of the white background behind, as it will be seen when you put your insert in the tumbler. Unscrew the bottom of the tumbler, pull out the insert that comes with it, and replace it with the one you made, then screw the bottom back on tightly. Et voilà… You’re done! Here are all the custom templates I have created so far, now broken out into separate categories for your browsing ease… These are all for the older 16 oz tumbler. Check back occasionally, because I do go on template making binges, so you never know when I’ll post new ones. Enjoy! Many thanks! I’ll put it up as soon as I get the chance. I was just looking online for some kind soul to put up some templates but I never thought I’d find any as good as these. The template is a psd, a photoshop format, so won’t render in a web browser. You need to right click on it, and save it on your computer. Let me know if you have any further problems with it. Why does it open with nero and doesn’t give me an option to open it with photoshop? It sounds like your computer has been told to open up .psd files with nero… Either change your computer’s preference, or open up Photoshop, and have it directly open the file itself. I have the 16oz if you still would like it. Thanks for this work. it’s been great. I’ve got one where the paper must have gotten damp because when I try to pull my picture out it just tears. Has anyone figured out a way to get the picture out when that happens? Would have been good if the clear plastic came off. I’ve never had this problem, so these are a couple of ideas off the top of my head… Maybe some canned air, or some sort of thin tool to loosen it up? Just be careful about not scratching anything. thaaaaaaaaaaaaaaaaaaaaaanks finally i found it !!! For best results use high quality, letter sized (8.5 x 11″) photo paper… Though, I guess, you could experiment with regular paper to see how they come out. Good luck! Hi there, thank you so much. I received one for Christmas and you were on the first page that pulled up when I started looking for them. I have started making my own inserts on my website and have a link back to your site for the templetes. Now my daughter wanted one and I get to make her a special insert. I’m glad I could help… Enjoy! First of all thank you for making these templates! I just bought a 12oz and 16oz tumbler and im making collages as a birthday gift, with photos and all. My question is that if i print it out will it really be the exact size of the tumbler papers or i have to modify it somehow to fit. Sorry if i sound dumb, first time i’m trying it out and on my computer the finaly work looks really huge!! I’m either doing something wrong, or it’s only my wide screen. Looking forward to your reply, and thanks again for helping so much! Ps. : you made some amazing ones! Somehow the 16oz doesn’t fit really, so I guess the tumbler i bought 1month ago needs the newer version – right? Thanks for your time you spend for that. There’s an old version, and a new version of the 16 oz tumbler… The templates on this blog are all for the old 16 oz tumbler. I’m still waiting for someone to send me a template for the new 16 oz tumbler, but I have no idea if, or when, I’ll get one. Sorry. If you should happen to find one before I do please let me know. Hi, I bought the starbucks 12 fl oz/ 355 mL tumbler and I found your blog to make the paper. So I accidentally got the 16 oz template size but strangely it’s smaller than my tumbler and I got the 12 oz but it’s smaller than 16 oz… Could you help me? I’m kind of having a mental breakdown. If you just bought it it’s probably has different dimensions from the old versions of the tumblers… It puzzles me why they would later change them when there was nothing wrong with the original ones. I suggest you do a search for “new starbucks 12 fl oz Create Your Own Tumbler”, and hopefully you’ll find something. Good luck! I purchased a few create-your-own stainless steel tumblers for family members a few years ago. I have since had the joy of creating new inserts by hand every year. My problem is that if I want to write anything (like the family tree) everything appears lopsided because you can not use straight lines on a conical shape and expect it to work. I have done my best to create a template that would work with limited success. If I used your templates would I be able to easily fix this problem? And just curious if you have found a template for the newest 16 oz stainless steel create your own tumblers or are you are still looking? Yes, I am still looking for a template for the newest 16 oz tumbler… If you come across one please let me know!!! Hi! I was looking around to see if a kind soul would care to put up a few designs for a Starbucks Tumbler I bought recently.. These are wonderful designs! Thanks for putting them up! I was here a month or two ago, I saw a beautiful galaxy (blue) city-like design in I believe the Nature Designs section.. I returned today to print it out but discovered it was not here. Was it taken down? If it was, can it please be put back up? Thank you for your kind words… Sorry, but I don’t see any missing graphics in the nature designs section, and that section hasn’t been updated, or modified, in quite a while. I hope you find what you’re looking for! If you find the raw image you seek I’d be willing to make it into a template for you, just contact me again with the info. Good luck! I love your designs and templates, they are fantastic. Can I please ask, do you happen to have blank templates for 17oz and 12oz latte mugs for Photoshop. I have just purcased myself a machine which will enable me to print to both mugs mentioned, and I cant seem to find blank templates which will allow me to add my designs to.